Are CIP and SIP the same thing – what are the differences? Up until the fifties, sealed systems such as pipes or process equipment in technical process plants had to be dismantled and cleaned by hand. This was invariably a time-consuming process. Especially in industrial sectors such as pharmaceuticals, food and beverage, where frequent and regular cleaning was required, manual cleaning of a system consumed an enormous amount of time. These industrial sectors benefited greatly from the arrival of CIP processes. This is because a cleaning method had been created that is still in use today, one which enables the internal surfaces of sealed systems to be cleaned without the need for disassembly (or only to a limited extent). For the most part, the CIP process is an entirely automatic one, to comply with defined process times and parameters. 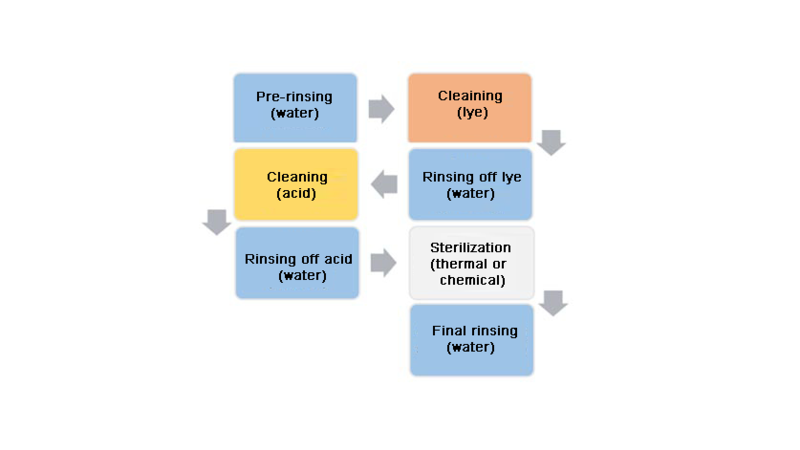 The cleaning operation is performed in a series of defined steps, as this flow diagram illustrates. Depending on the application, cleaning temperatures are up to 100 °C. A turbulent flow is also required, with flow rates usually between 1.5 and 3 m/s, to remove all impurities. The CIP cleanability of the measuring equipment has been confirmed by the EHEDG certification of the WIKA products. The SIP process, also referred to as ‘Steam-In-Place’, is an extension of the CIP process by an additional sterilisation, without any necessity for disassembling the plant and the measuring equipment1. The sterilisation of hygiene-critical processes takes place at the end of the actual CIP process. This ensures that any microorganisms still active in the system are killed off with hot water or with saturated pure steam at high temperatures (> 121 °C), without using an autoclave2. Of course, WIKA offers appropriate measurement technology for CIP and SIP for a comprehensive range of measurement parameters in sanitary applications.